My father is from the great state of Minnesota, the Land of 10,000 lakes. Years ago, he told me the story of a fisherman from Minnesota who was extremely well prepared for fishing. He knew everything there was to know about fishing. He had everything you need to be a good fisherman: the poles, the bait, the nets. He even had one of those hats (you know, the ones with all the lures sticking out). But this fisherman had a problem. You see, for all his preparation, he never caught fish. Not one. Not ever. Can you guess why? The answer is easy. He never went fishing. He never got into the boat. He never left the dock. And therefore, he never caught a fish. When Jesus was 30 years old, he went walking along the shore of the Sea of Galilee. He came upon two sets of brothers: Peter and Andrew, James and John. They were fishermen. As they stood in their boats, preparing their nets, Jesus called them. “Come, follow me,” Jesus said, “and I will make you fishers of men” (Mark 1:17). So they followed Jesus for three years – three years of ups and downs, three years of learning. Jesus taught them. They saw his miracles. They heard his promises. For three years, Jesus trained them. These guys were extremely well prepared for fishing. Then Jesus sent them out to go fishing. God has prepared you in much the same way. He has called you to follow him through his Word and the waters of Holy Baptism. He has trained you with that same Word as you’ve gone to church and Sunday School – as you’ve read your Bible and grown in your faith. 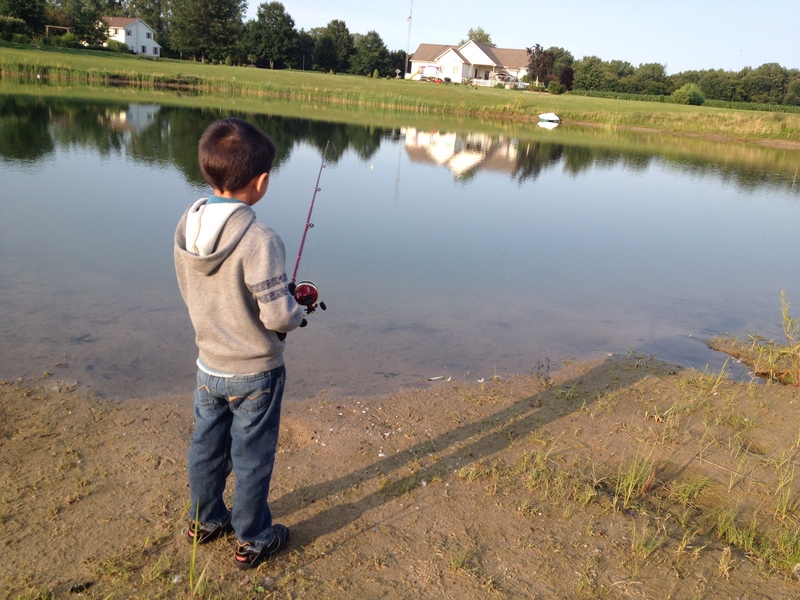 He gives you all the tools you need to be a good fisherman: his Word and Sacraments. You see, fishing in Jesus’ day wasn’t complicated. They didn’t use poles and hooks and bait. They didn’t have a different color lure for every fish and season. They simply threw nets into the water and pulled. Being a fisher of men isn’t complicated. We just throw out a net. We tell people the truth about their sin and its consequences. Then we tell them about Jesus and how he suffered the consequences of their sins in their place. We tell them about forgiveness and heaven. Fishing isn’t complicated. You don’t have to bait them. You don’t have to hook them. Simply tell them about Jesus and his love. God has trained you. He has given you all the tools you need to be a good fisherman. You are extremely well prepared for fishing. You aren’t going to catch a thing, however, if you don’t get off the dock. Jesus has called each of us to “go and make disciples of all nations” (Matthew 28:19) and you don’t have to go far to do so. We all have friends and family members, neighbors and co-workers, who either don’t believe in Jesus or who have gotten away from God’s Word and church. How can they know about Jesus unless somebody tells them? And if they don’t know – if they don’t believe – what will happen to them when they die? The Bible is clear. “Whoever believes and is baptized will be saved, but whoever does not believe will be condemned” (Mark 16:16). Fishing isn’t always easy. Some people won’t listen. Some may even get mad, but this is important. Souls are in danger. People are dying. Your Savior is calling and his call has urgency. So talk about your faith. Talk about your Savior with everyone you can. Don’t be left standing on the dock. Let’s go fishing.